Explain what M.E .really is and how the immune system is affected. Examine common symptoms, including emotional pain, loss and stress. Examine hyperventilation and its role in anxiety, disease and fatigue. Look at other illness which may cause chronic fatigue. Look at why cardio-vascular exercise is usually inappropriate in the acute stage and what level of physical activity yoga should offer the individual. Help to understand the problems of secondary de-conditioning, and look at maintaining health of the spine. Examine the ‘toolbox’ for healing: pranayama, relaxation, visualisation, and gentle stretching. Guide teachers to direct students on the spiritual relevance of yoga and their illness. Examine personality types, how this can work against recovery and how yoga can address this. Look at the different levels of M.E. Teach how to listening in and ‘read’ students. Discuss how to prevent relapse and look at what can help bring energy to the body. Show how to teach students pacing and the doing less-is-more approach. Why we need to ‘be’ and not ‘do’ Difficulties of the 21st century context in recovery. Explain the stigma of the label of M.E. The mind-body-spirit approach to this. Teach two simple but effective therapeutic regimes for those with chronic fatigue and M.E. Examining pranayama and postures that specifically help, such as inversions – and understand why. Wheelchair and chair work. Look at working from the heart with empathy and with an individual approach to each case. Learn how to treat those who are severely affected. Look at the relevance of bandhas and chakras in energetic healing. Show how to integrate students into a class, if appropriate. Show how to set up a remedial class locally, giving contacts for getting started. Demonstrate yoga nidra and cyclic meditation – and how deep relaxation and visualisation promote healing. By the end of the workshop teachers will have a good understanding of M.E and chronic fatigue, what causes these conditions and how to recognise them. They will understand how to teach yoga in a way which is both effective, gentle and appropriate to the individual and which will promote healing, energy and change. At the very practical level, teachers will have learnt at least two remedial routines including some chair work, which they can use with students and will also have advice on how to set up special groups for those with chronic conditions in their area. This course is now accredited as IST by the British Wheel of Yoga. Fiona Agombar is an experienced yoga teacher who herself had M.E. for 15 years as a consequence of stress combined with a viral infection whilst running a large public relations agency. Initially she was in a wheelchair but she recovered, thanks to following a yoga lifestyle and with the help of her mentors Angela Stevens and Bill Feeney. In 1997 Fiona wrote the definitive book on yoga, fatigue and ME: Beat Fatigue with Yoga (Cherry Red Books). She now teaches hatha yoga and yoga therapy full-time, runs regular retreats for people with ME and spends much time in India studying yoga in depth. Fiona was a Trustee of Action for ME for 10 years and is a regular contributor to Yoga and Health magazine. 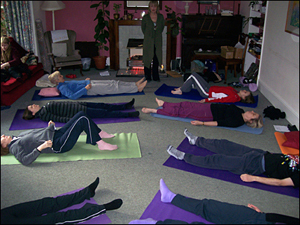 She has recently made a DVD Beat Fatigue with Yoga with Sue Delf of the Yoga Academy. 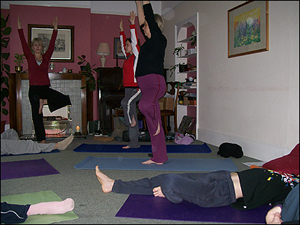 Fiona originally trained in classic hatha yoga and yoga therapy with the Yoga for Health Foundation. Her other training includes time spent at the Vyasa ashram in Bangalore. She is now training in the Krishnamacharya tradition with her mentor Gill Lloyd, a student of Desikachar.